Very big numbers all-round and no surprises – i.e. coins with under one million mintage (that people seem to go bonkers over for some reason). I find it odd that the figure for the standard £2 coin is dwarfed by the total mintage of the commemorative £2 coins. There seems to be little point of making a standard coin at all, when clearly the aim of the Royal Mint seems to be to make as many different commemorative coin types as they possibly can. People will no doubt go mad for the 3 coins that were made for sets only. My opinion is that in years to come those will be the ones that will be among the most common in as-new condition. They will exist in the many sets produced and very few will get spent. In the past, the coins that have proven to be the hardest to find and often most expensive to buy in as-new condition are actually the exact opposite, i.e. 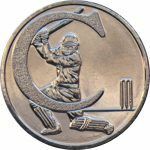 coins that were not included in annual sets and only went into circulation – the most striking example being the 1999 standard £2 coin (not the Rugby one) which is almost completely unheard of on very good condition.